The Hayabusa FPP Straight Heavy Cover Hook was designed for flipping, pinching, and punching in light to medium cover. This hook excels in weeds, grass, and debris pile ups. It has a remarkable balance between the gap width and the shank's length, an extremely durable medium to heavy wire, and hook point that is strong and extra sharp. The FPP Straight Heavy Cover Hook also features a Loop Stopper that prevents your soft plastic bait from sliding on the hook and also provides protection from tearing. The Perfect Closure Ring helps to keep your line from breaking while keeping your knot in the perfect position in the hook eye. 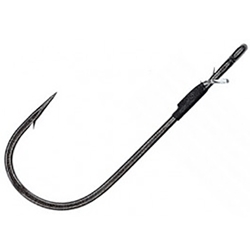 This hook was designed specifically for bass fishing and is another must-have!